Blue Moon Furniture- Blog-What are you Thankful for this Thanksgiving? We are thankful for our friends Sacha of French Accent Design and Charmaine of Charmaine Mallari Photography for their help with out Thanksgiving Party display and great photos. We are thankful for getting to work in a space filled with light and beautiful furniture including our Majestic Live Edge Dining Tables and Cocoon II sectionals. And most importantly we are thankful for our stylish, fun, uncompromising clients who are a blast to work with and make all this possible. 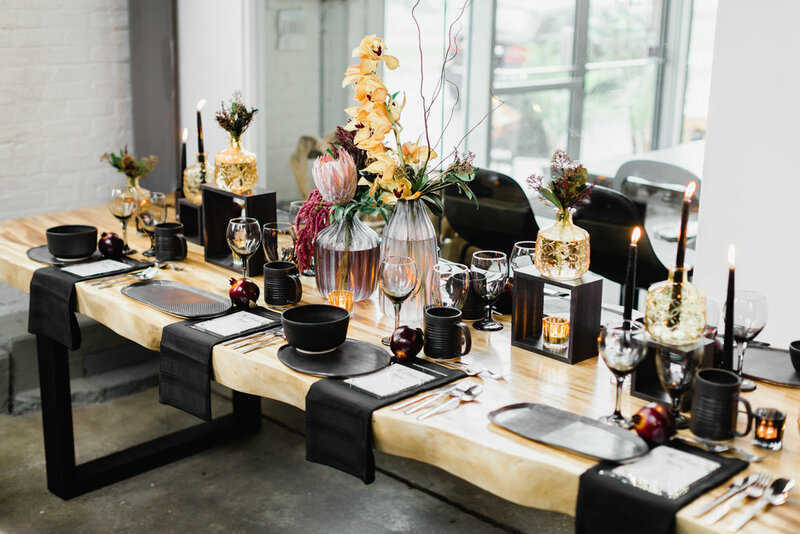 This Thanksgiving our Majestic Live Edge Dining Table takes on a moody look that references an updates the classic orange and black October colour palette. Bronze, blue and charcoal with pops of red do the trick, very current and very fall. The Cocoon II in luxurious velvets make for a welcoming seating area in blue and bronze. Toss cushions all coordinate making the look playful and sophisticated all at once. 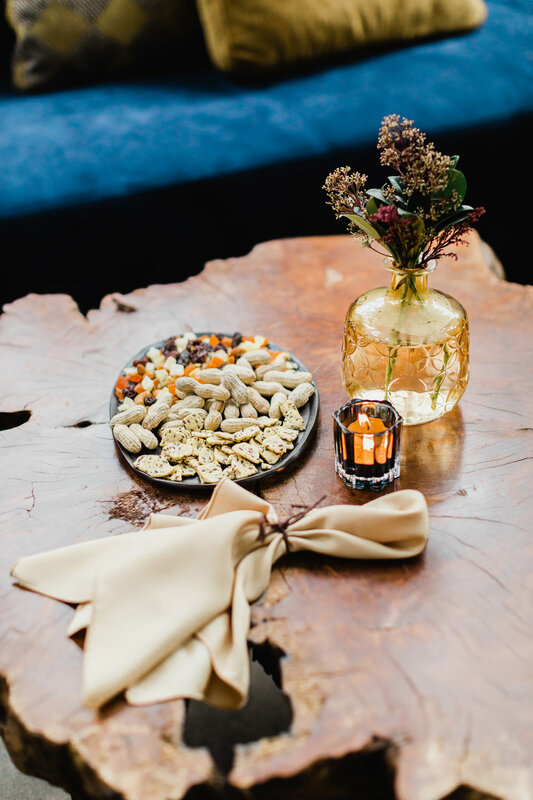 Earthy wood tones, like on this Lychee wood coffee table, keep the look warm and spontaneous and even the snacks work with the colour palette. 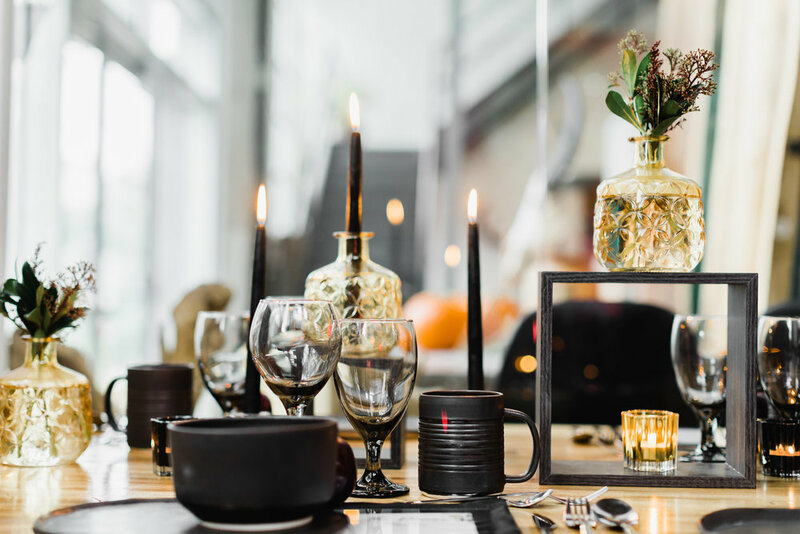 No romantic tablescape is complete without burning candles. The centre piece does not need to be elaborate. A couple of well chosen blooms will do the trick and take your table top to the next level. From start to finish the look is very luxurious and welcoming. I dont know about you but I am ready to sit down to a Thanksgiving Feast! Happy Thanksgiving. Stop by 109 Pacific to see the display in real.